Course pages may be added to your personal teacher website in a mini-site named after the course. The mini-site option will allow you to select your course site when adding assignments, events, and news. 1. 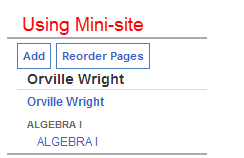 Starting from your main teacher page, click the Add button located on the top left side. 2. Select Mini-Site from the pull-down menu. 3. Give the Mini-Site the name of your course. 4. Click the Create button. You now have a named folder but without pages. 5. Click the Add button in the middle of the screen. 6. Give your page a title and add a friendly URL that you can give out to your students and parents. 7. Choose a template. Included are 3 column and 2 column layouts with or without navigation. In most cases, you will want to choose a template with navigation so your visitors can easily get back to your main page. Once you've created a course page you're ready to add content using Elements such as Rich Text Editor, Slideshow, Locker and Calendar. Be sure to visit our help page on building pages if you haven't already or if you need a refresher. 1. 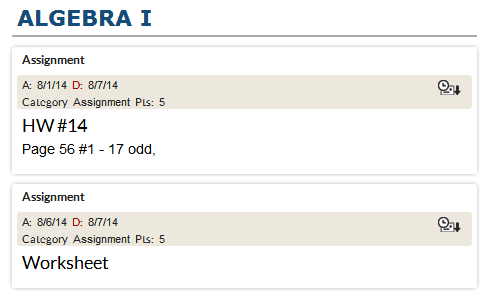 Choose the Current Assignment element after clicking one of the green plus signs on the page. Any assignment for that course which has been assigned but is not yet due will now appear on your page. 1. Choose the Locker element after clicking one of the green plus signs on the page. 2. Any files uploaded to the Resources of your course site will automatically display in the Locker. 3. 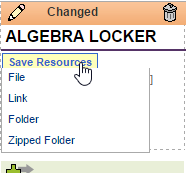 You can also use the Save Resources button on the locker element to upload files directly to the locker. 1. Choose the Calendar element after clicking one of the green plus signs on the page. 2. Click the pencil icon on the top left to change the calendar format. 3. 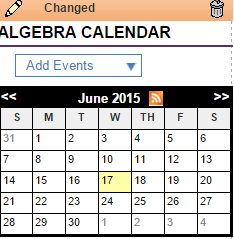 Click the Add Events pull down to add events for your course calendar.